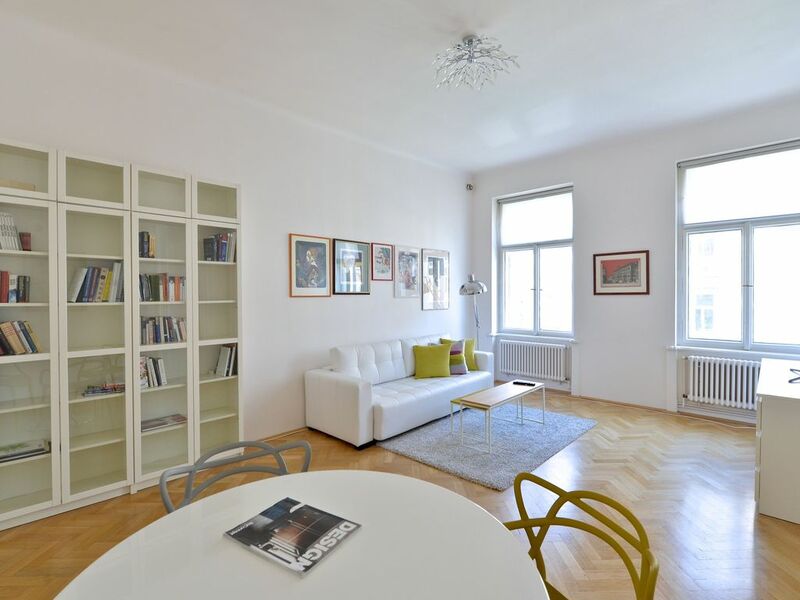 This is a 19th century apartment with high ceilings and a lot of space to relax (92sqm) after a long day in Prague. Also, there is a beautiful balcony that you may use for breakfast or just to sit and relax. The apartment is fully equipped. - Clean towels (Each guest will receive 1 set of bath and hand towel. If a guest is staying longer than 5 nights, he/she will be provided with a new towel set every 6th night) Breakfast upon request. Feel free to help yourself with what's available in the kitchen. Some items may vary from time to time. If you replenish what you consume, it is appreciated but if you don't, it is fine. Please be advised that this apartment is on the 3rd floor and the elevator is not yet in service. Thus, it is not suitable for people with disabilities or walking difficulties. Whether you are coming to Prague from the airport or from the train station, the location is just perfect. I included the directions in the description below. This apartment is located just in the middle of the historical Royal Vinohrady area, next to the National Museum. This is the most wanted area in Prague, best know for it`s famous residents. There are many painters and writers, who live permanently nearby - they have often been inspired by events and conversations taking place in the park next to my apartment and immortalized the park in their fiction. Vinohrady is very popular because this historical area doesn`t get as much noise as Wenceslas` Square (which is 2 blocks away) and other noisy locations, yet, it is an area of the best restaurants, clubs and shops in Prague. Visitors can reach Wenceslas Square in 5 minutes and the Old Town Square within 10 - 15 minutes walking and continue down to the river to explore more of Prague. Clienlines is my nr. 1 priority, therefore, we clean pillows, blankets but even mattresses and sofas regularly with a special water-cleaning hoover. Upon request, I provide anti-elergic pillows for people sensitive to feathers. Otherwise, the pillows and blankets are filled with duck feather, no polyester. I have my own driver, Mila, who is always happy to pick you up and drop you off at the Airport. The price from the airport to the apartment is 30USD and from the apartment to the airport 25USD. Please note that the regular fee for Czechs is about 45USD and all the taxi driver rip off tourists, so I strongly discourage you from taking a regular (even an official) taxi. CAUTION: due to an increase of complains in Prague, I strongly discourage you from using taxies in Prague, unless you negotiate the price in advance. Please be advised that taxi rates within the center should not exceed 9USD. If you need a taxi, please text me and I will order it for you. CAUTION2: in Prague, there are many money exchange companies that rip tourists off. I suggest you either take money from ATM or use XCHANGE in Jindrisska street, Prague 1 (very close to Wenceslas` Square). I believe that behind every successful project, there is an idea. The reason why I am renting my apartment via airbnb is to make guests` stays in Prague memorable in the best possible way. I am always happy to help with travel plans, give directions but most importantly, to provide pieces of advice that will safe time going to places which are not really worth it. People who know Prague well will tell you that Prague is about hidden small places with unique atmosphere. Those places are hard to find and they are not included in most of the guide books. Where do the money go? I am the owner of a mid-size company in Prague and that involves a lot of traveling (mostly California, Miami, New York) that is my full time job. I do airbnb for a different purpose and the ENTIRE amount of the money that I receive is used to preserve this beautiful building. Thanks to your support, I already reconstructed all statues and decorations in the corridors of the building, isolated the cellar from wet ground, reconstructed the roof of the building (when I bought the apartment, nobody in the building paid any attention to the corridors) We also managed to built an elevator, especially to allow older people to use the building as well. By April 2015, I will have built the elevator to every floor, and all corridors reconstructed just as they were in the times the house was built. In 2015, I hope to take care of the beautiful yard which is a bit neglected today and turn it into a small oasis in the heart of Prague. Whatever was achieved was due to your help and support. My name is Andreas, I used the apartment during my studies and I will never forget living there. The place has grown into my heart. After I moved to a more quiet area, I used the apartment for our friends and family visiting while they were in Prague. I thought it would be great to open the apartment to everybody to let other people share the joy from staying here. Also, I thought my guest may become part of an interesting project. You will find more about the project in the description of my listing. You are welcome to stay in my apartment when you visit one of the most beautiful cities in the world, Prague. This is a very large apartment in a quiet neighborhood. Several blocks to trams, bus, and metro which will quickly take you to anywhere in Prague. Good restaurants and grocery stores nearby. Lots of closet space and drawers. Nice fully equipped kitchen. The elevator does work. Light, airy, quiet. Uphill walk from train station, better to Uber etc. Enjoyed Prague as we learned to avoid huge crowds and use bus/tram, metro. Owners of unit had long term renters before us; they do not appear to be hands on so TV was non functioning. They sent a friend to connect and he assured us programs would be resumed by owners(never happened). Dryer was broken (we were told it would be repIred) nope ( clothes dry quickly in living room. Coffee pot had no carafe, skillets were worn beyond use ( owners friend gave us his). Old sponges, no paper towels. These little things cost an owner little and provide much. HOWEVER!!! We were allowed to leave our bags past checkout. Wonderful. Sorry for the complaining, but one does need to ck things out. I am sure in the future they will hire someone to help them. Glorious kitchen by the way. Leasing company very helpful. This is a lovely apartment in a great location. Being adjacent to the park was perfect for a morning run or an afternoon stroll. The coffee shop and restaurants in the neighborhood were all very good. I have travelled extensively in Europe and must say the city of Prague is one of the most beautiful cities I have visited. What makes Prague even more special are the people. They are friendly, warm, happy people. I cannot wait to return. Sarah and her team will be who I contact for all my accommodations. They are great!!! Sehr schöne Wohnung, alles super ! Tolle Wohnung in guter, zentraler Lage ! Wir haben die Wohnung als Familie mit zwei fast erwachsenen Töchtern sehr genossen. Sie bietet alles, was man für eine Städteerkundung benötigt! In der Nähe sind zudem gute Lokale! Der Vermieterservice ist prima ! Within few steps from the center (100m far from 2 major metro lines, 300m from the National museum and Wenceslas square). There is a beautiful park called Riegrovy Sady 30m from the apartment suitable for running. In this area, a quiet and residential area meets Prague's most wanted spots. Wenceslas square, with it's National Museum is an ideal start of your stay. Also, in the vicinity of the apt, there are Prague's best restaurants and clubs. The National Opera is just 200 meters from the apt. Take a walk to the Charles Bridge (built in 1357) via Wenceslas square and Old Town Square. On the way, you will see the best Prague has to offer. Prague is relatively small and if you enjoy walking, there is no need to buy a travelcard. This place is located just in the middle of it all. Sure. You can take a taxi from the airport for maximum 600czk (about 25euro) make sure you ask the driver about the price before you come into the car, because some drivers may want to rip you off and charge you much more. Also, there is a bus that goes from the airport to the nearest metro station (dejvicka) it takes about 15 minutes, depends on the trafic. From dejvicka you go either 6 stations to Museum (the national museum /max 500m from the apt) or you exit after 7 stations at Namesti Miru (300m from the apt). I think there could be four people, but the 4th will have to sleep on the sofa, which is possible. I don't have an extra bed, but the sofa is suitable for sleeping.